[Shenzhen, China, March 2018] HUAWEI released its audited financial results for 2017, reporting solid business growth. The company's total annual revenue was CNY603,6 billion (US$92,5 billion based on year-end exchange rates), an increase of 15,7% over 2016. Net profits were CNY47,5 billion (US$7,3 billion), an increase of 28,1% year-on-year. In 2017, HUAWEI's annual investment in research and development reached CNY89,7 billion (US$13,8 billion), up 17,4% compared with 2016. The company's total R&D spend over the past decade has exceeded CNY394 billion (US$60,4 billion). In 2017, HUAWEI's Carrier business group generated CNY297,8 billion (US$45,7 billion) in revenue, an increase of 2,5% year-on-year, focusing on helping global carriers maximize the potential of their existing network assets and seize new opportunities in video, IoT, and cloud markets. HUAWEI's Enterprise business group enhanced innovations in cloud, big data, campus networks, data centers, IoT, and other domains, and drove extensive application of its products and solutions for a range of vertical industries. 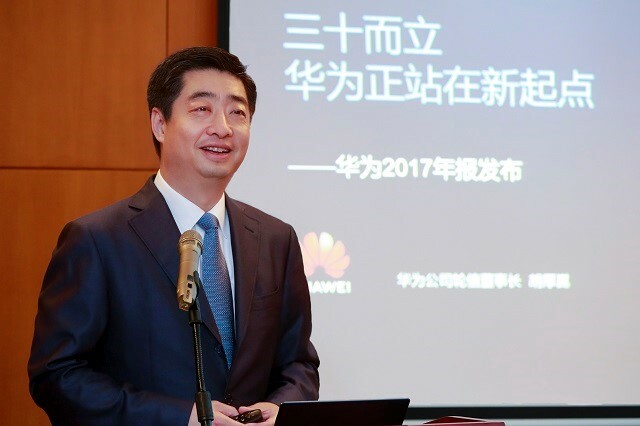 In 2017, HUAWEI's enterprise business generated CNY54,9 billion (US$8,4 billion) in annual revenue, an increase of 35,1% compared with 2016. In HUAWEI's consumer business, the HUAWEI and Honor brands ran full speed ahead, leading to rapid growth in their respective markets. HUAWEI shipped a total of 153 million smartphones (including Honor) in 2017, and reported CNY237,2 billion (US$36,4 billion) in annual revenue, up 31,9% year-on-year. HUAWEI set up a Cloud Business Unit in 2017, which launched 99 cloud services across 14 major categories, and over 50 solutions. The company also unveiled the Enterprise Intelligence (EI) platform, and developed over 2000 cloud service partners. Note 1: All CNY figures in the Annual Report were converted into USD using the closing rate on December 31, 2017: US$1,00 = CNY6,5222.